Today's project is really a project for two. Like you and someone with a nail gun. Or maybe you have a nail gun, you might still need a friend to help since some things are just easier with two sets of hands. 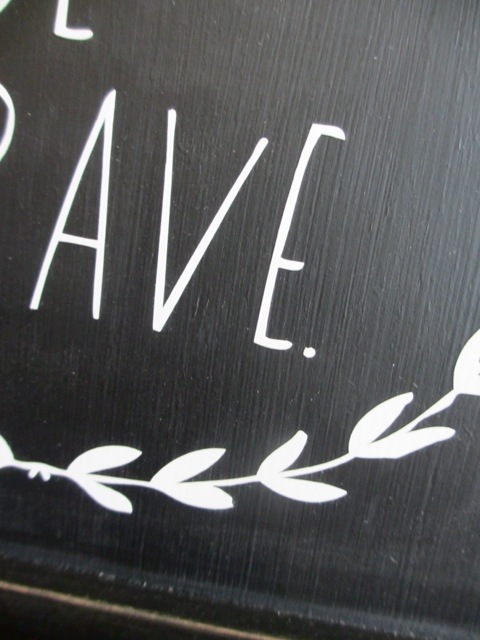 I had the idea of creating a message board for the wall by our front door. This was caused by the removal of a wire basket that was taken down to paint. The anchor came out of the wall and left a large hole which my husband did patch but I still didn't like it. Every time I looked at the wall my eye went right to it. I'm a problem solver. Enter the idea of the message board that was just wide enough to cover the offending spot. I, of course, need a nail gun to complete the project. My husband has a nail gun so he is quickly enlisted to help bring yet another of my crazy ideas/drawings to fruition. And off to the orange store we go (he, of course, is still wishing he didn't take the basket down to paint). 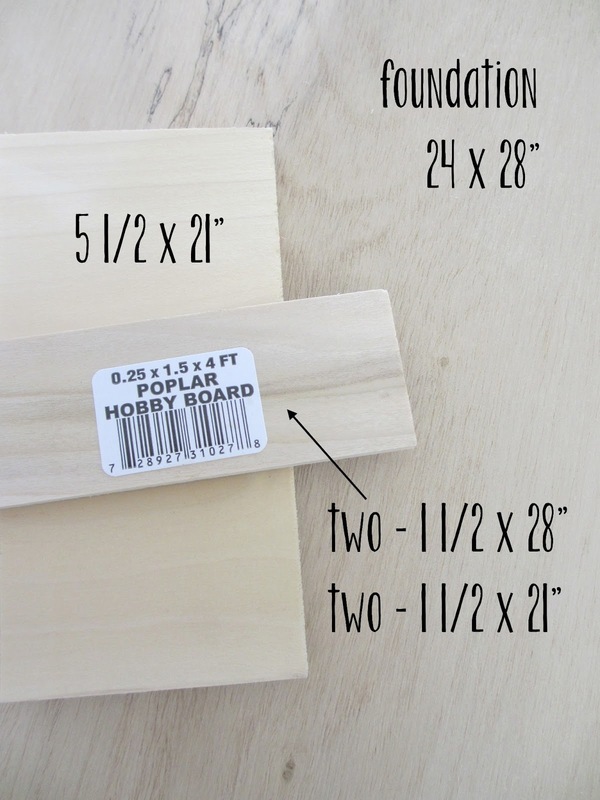 At Home Depot there is a bin called Hobby Boards, it is in the lumber section by the moldings. The boards come in various lengths and widths and most are 1/4 inch thick. You can also see on the display that they come in red oak, poplar and alder woods as well. We chose poplar because it has a fine grain and paints nicely. 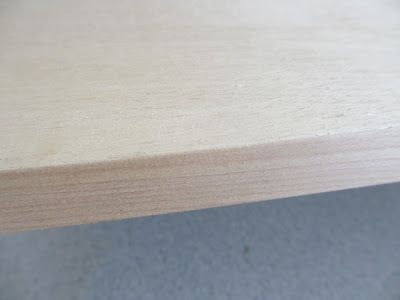 one - foundation piece - 1/4 sheet of plywood, 3/8" thick. The 1/4 sheet of plywood started as 24" x 48", we cut the piece 24" x 28", leaving a 24" x 20" piece for another project on another day. After this photo was taken, my husband went to the garage and painted the top portion of the large foundation with two coats of Chalkboard paint. 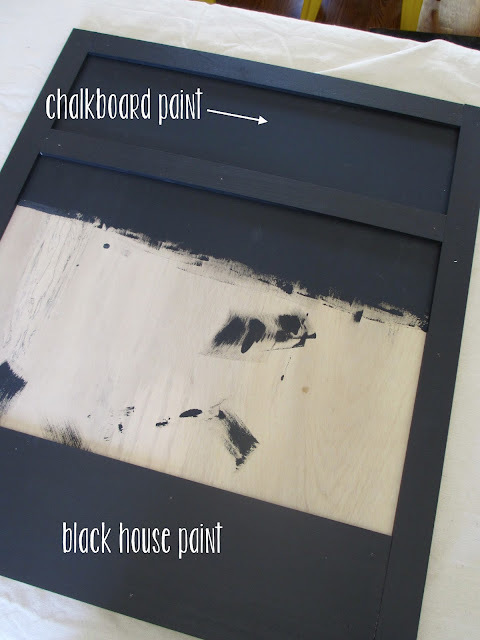 Make sure you really stir the chalkboard paint before use. I mean stir for 5 minutes not just 4 or 5 quick stirs like I usually do. This will make all the difference in using this kind of paint. I painted the hobby boards with regular black house paint. Once dry, he secured the hobby boards to the foundation with the nail gun. I had him leave about 6" of space in the chalkboard area at the top. 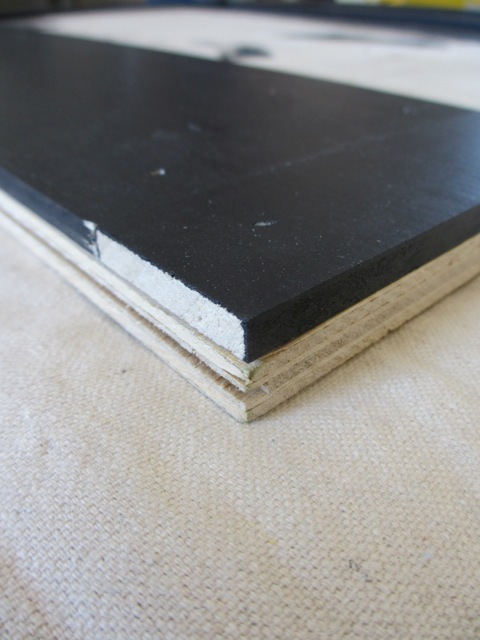 Here you can see the "sandwich" of the boards. The foundation on the bottom and the hobby boards on top. Don't worry about the sides, they will be covered up in the end. 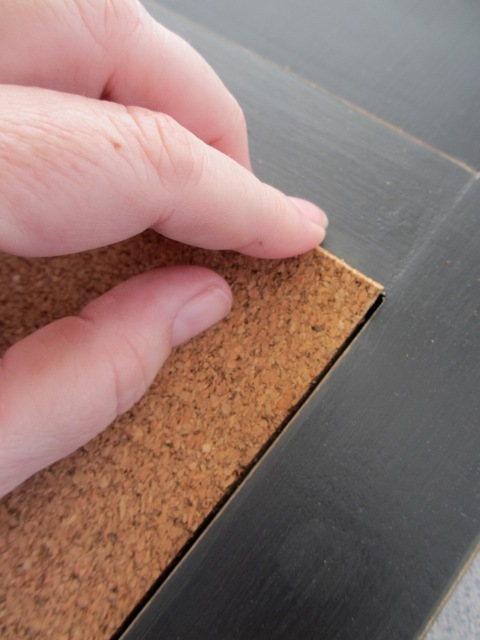 Now go back and use wood putty to fill in the nail holes and any uneven ares. 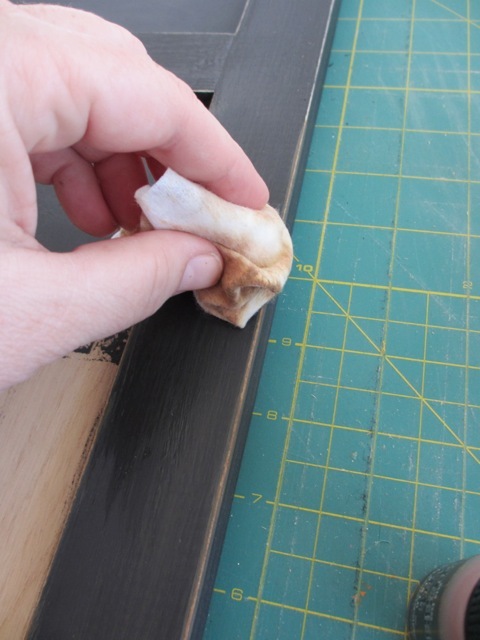 Wait at least a couple hours for the wood putty to dry, then sand until smooth. 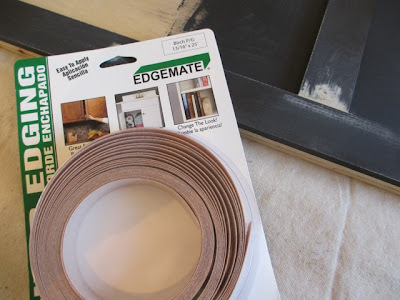 Next were going to Edgemate or "magic tape" as I like to call it. 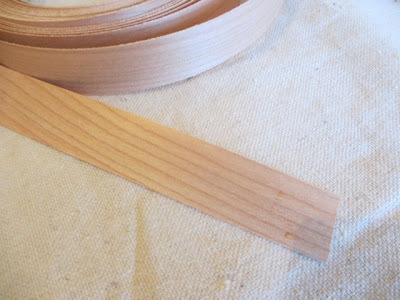 With a hot iron (no steam), lay the wood tape on the edge of the board and just iron on. It really is that easy. Why do you need a friend? 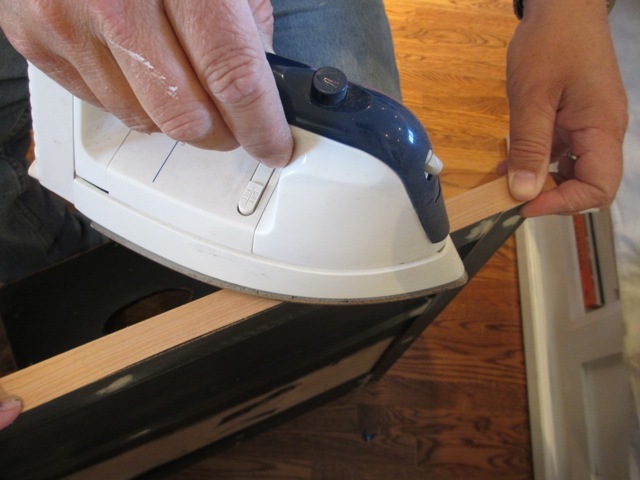 It is much easier if someone holds the wood strip in place while you move the iron along the top. You can see my fingers in the bottom left corner as my husband moves the iron along the top. 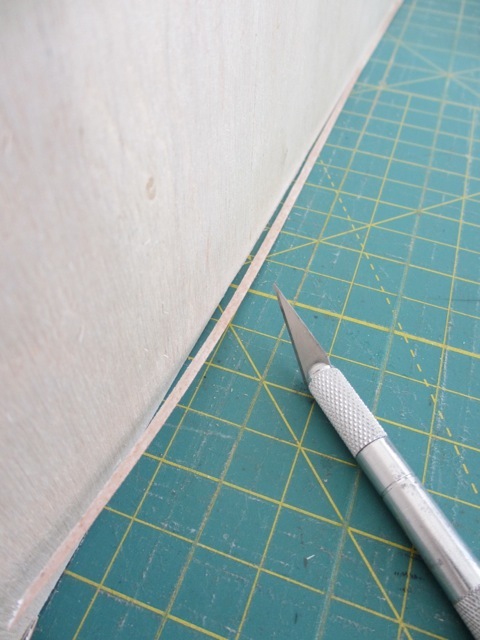 Once you get to the end of the board just cut the wood strip off with a box cutter. Turn the board and start on another side. It took us all of 20 minutes to do the entire board and that included me stopping to take a few pictures. Back to the craft table to cut off the excess wood veneer. I just ran my X-Acto Knife along the edge. Super easy. Then sanded it. Hard to tell the foundation from the wood strip isn't it? 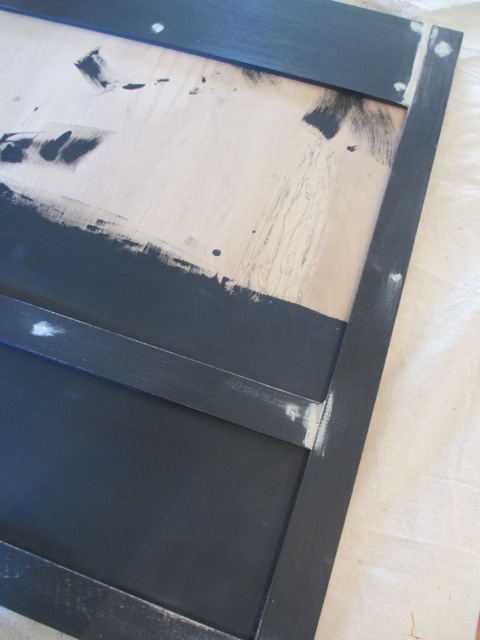 Okay, so open the paint can again to paint the raw sides and cover the wood putty spots. Let dry. I can't really make something without distressing it, so out comes the sanding grip to "take the edge off it" so to speak. I went around all the edges of the board. ...until it looked like this. Next - cover up the center. 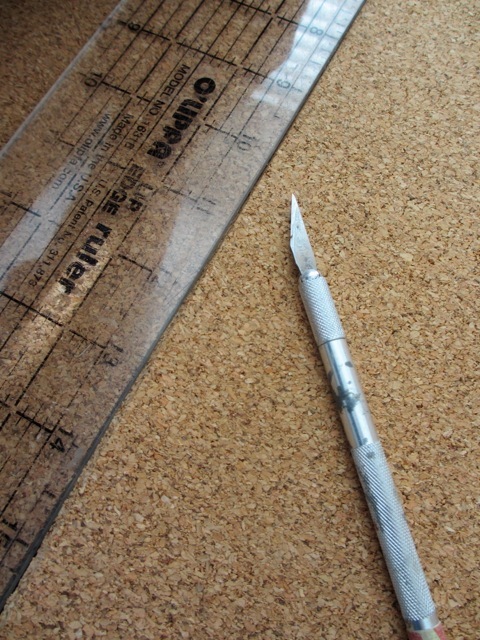 I rolled it out on the table and cut the size of the center with an X-Acto knife and my clear quilting ruler. That roll was big and curly so this is a place you might need a friend too. One to cut and one to wrangle the cork roll. I used 1/2" Wonder Tape along all the inside edges of the empty space. 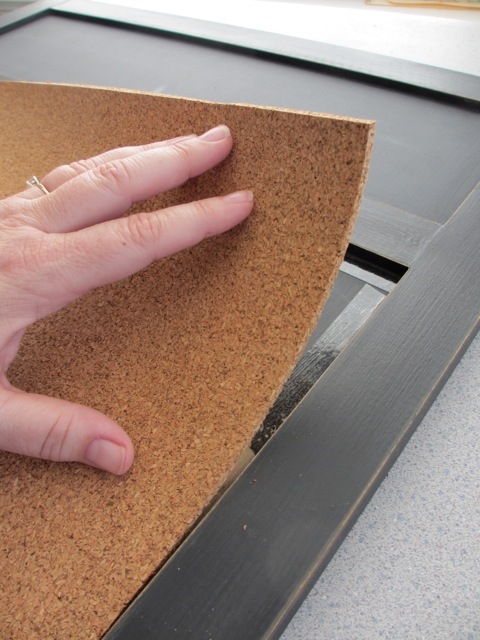 You will need more adhesive in the center too. Now just ease the cork into the space. 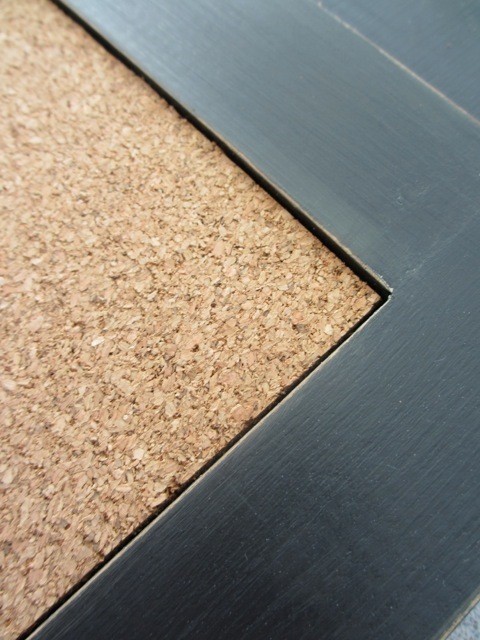 I cut mine just a bit (and I mean a small bit) over the size off the square so that it would be tight. It took a bit of finagling but I got it to fit perfectly. 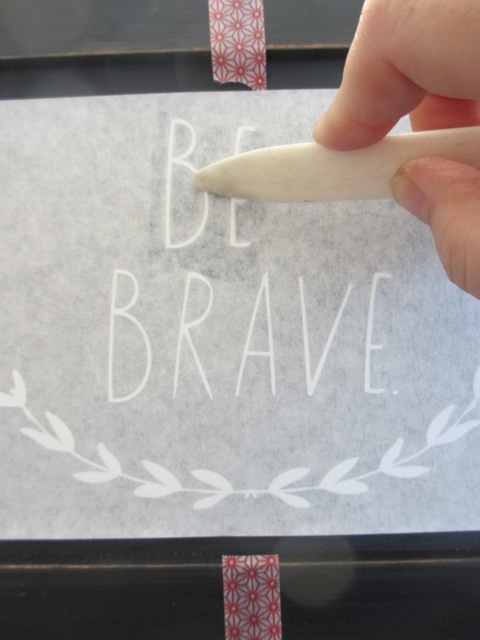 So, being quite realistic in the fact that if I wrote at the top of the chalkboard I would - A. hate my writing or B. never take the time to change it once it was written, I bought a vinyl transfer from Shanna Murry. I am a long time fan and user of her unique products. Yes, I know they are a bit pricy but the style and quality is great, just what I needed for this piece. I used some washi tape to mark center. 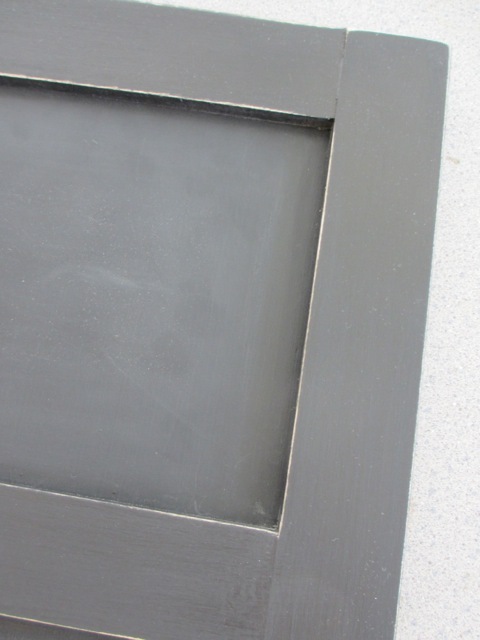 Then a bone folder to rub it to the chalkboard. 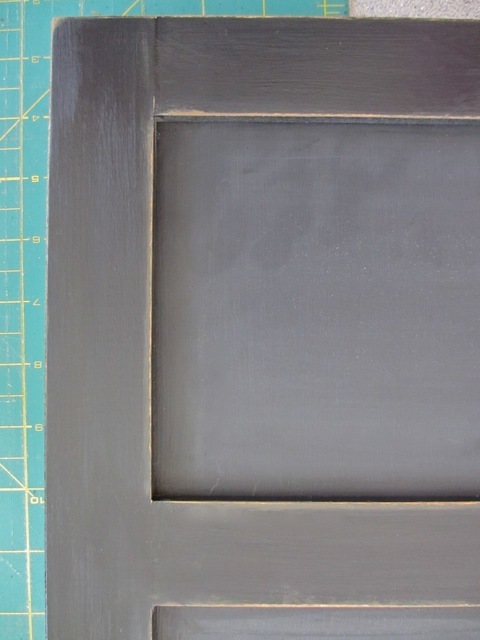 So I know you are scratching your head right now thinking, "why did she paint it with chalkboard paint when she isn't going to use it as a chalkboard?". 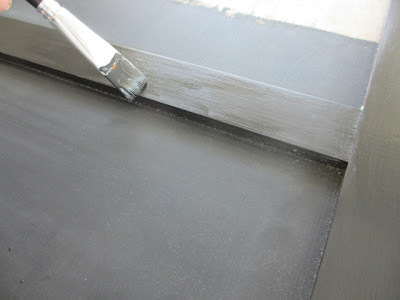 I wanted the look of a chalkboard (in person it does look different than house paint) but not the mess. 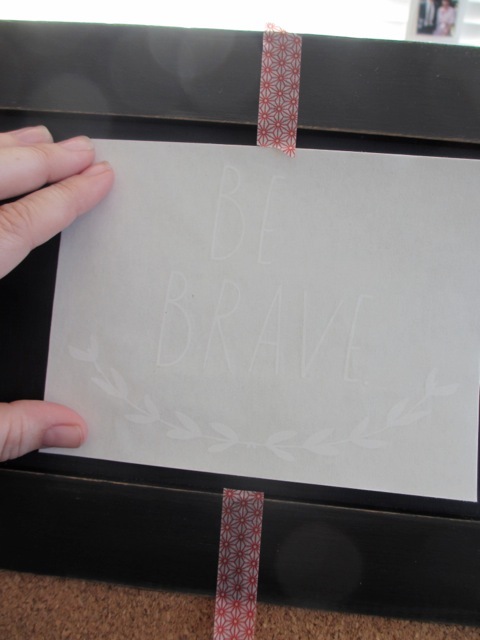 I also still have the option to write something next to the vinyl transfer if I so choose. 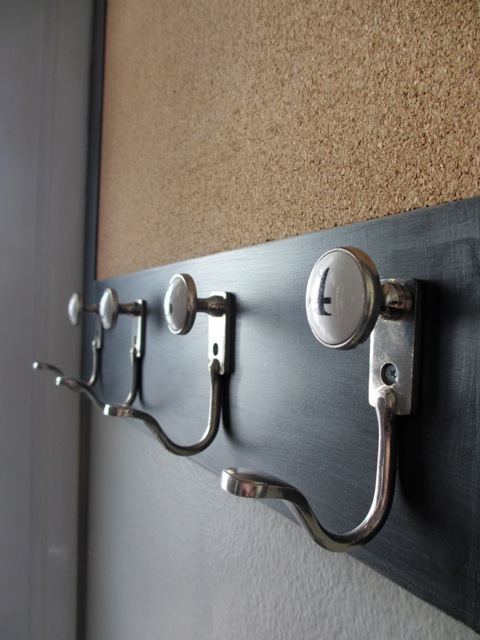 We needed a place to hang keys on this board; so, out to the garage I went. 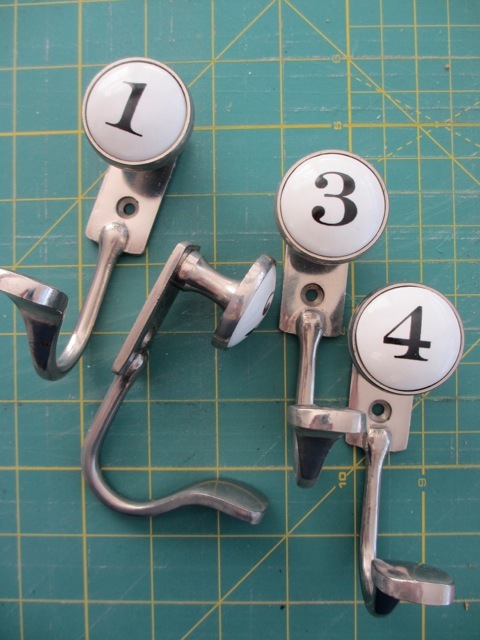 I knew if I dug hard enough I could find these hooks I bought back in 2010. Seriously, the receipt from Pottery Barn was still in the box. I am quite sure you can find something similar at Anthro or Target now. At one time they were suppose to go in the bathroom for towels, never happened. So, now they will have another life. 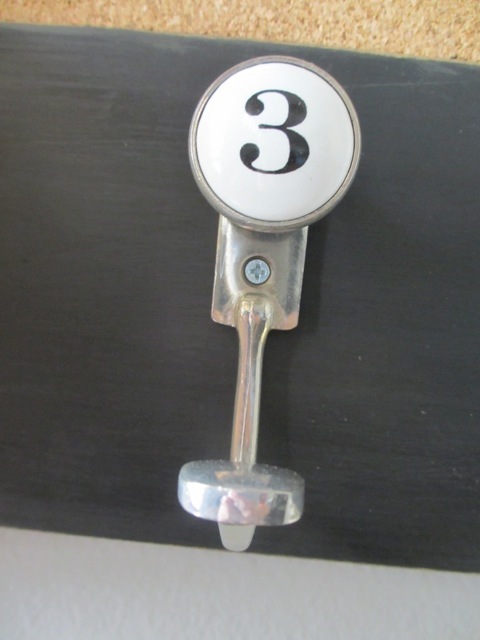 My husband used a wood screw to secure the hooks to the 5 1/2" strip at the bottom of the board. And now it's hung and ready for use. A great message to see as you pick up your keys to leave for the day. Or in my case... I pass it as I go down the hall to "work" in my craft room or office. Cheers for a great weekend everyone! thanks Carol! I like it so much! Your message board turned out great! That is way too cool!! nice work Paula!! I love the hooks too! You really can do EVERYTHING! AND do it all so OUTSTANDINGLY. 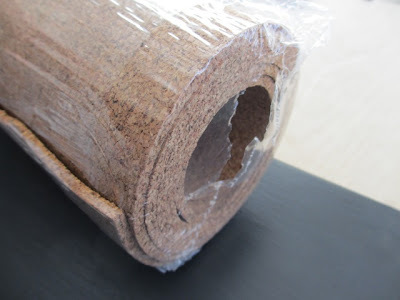 Do you have a cute holster for your glue gun - perhaps made from Tim's fabric? I love, love, love this project. Joy, I bet you are on your way to Home Depot for wood right now. I knew you would like this one! oh. my. word. A.D.O.R.E. every single thing about this project!!! I may make a hole in the wall just to get to make one!!!! Thank you for the great inspiration!!! Chelle, that's called "creating a need" at my house! Exactly how I got a new bathroom. While he was at work, I gutted it and therefore "created a need". Works every time! You GO, Girl!!!! LOVE it! thanks Dawn! what a nice thing to say! WOW..a 5***** project; would you like to adopt me? I have a lot of great skills & easily trained!! love to Susan! Maybe we can think up more nail gun projects! thanks eileen! I do love that typewriter which was a gift from my husband! another great project Paula!!! Love it!! Beautiful! Looks great! You've got skills! Thanks for the tutorial. Beautiful! I know it's been said here before but can't think of other better word to describe it ;-) love it! Oh Paula, I love, love, love your message board! I'm sending my husband (who just happens to be a carpenter with many nail guns) off to Home Depot right away. 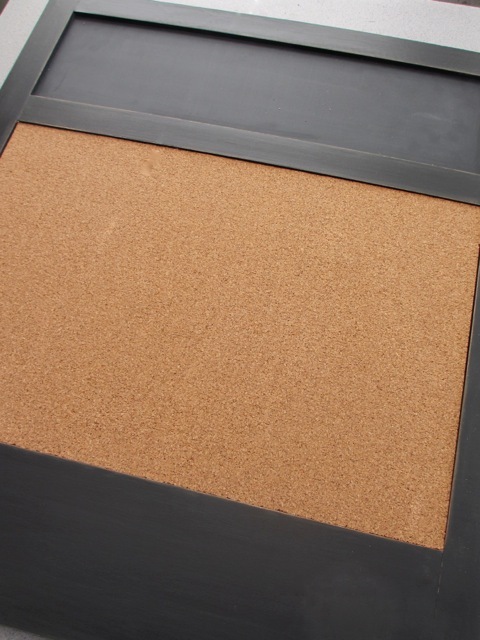 I'm making a message board for myself. 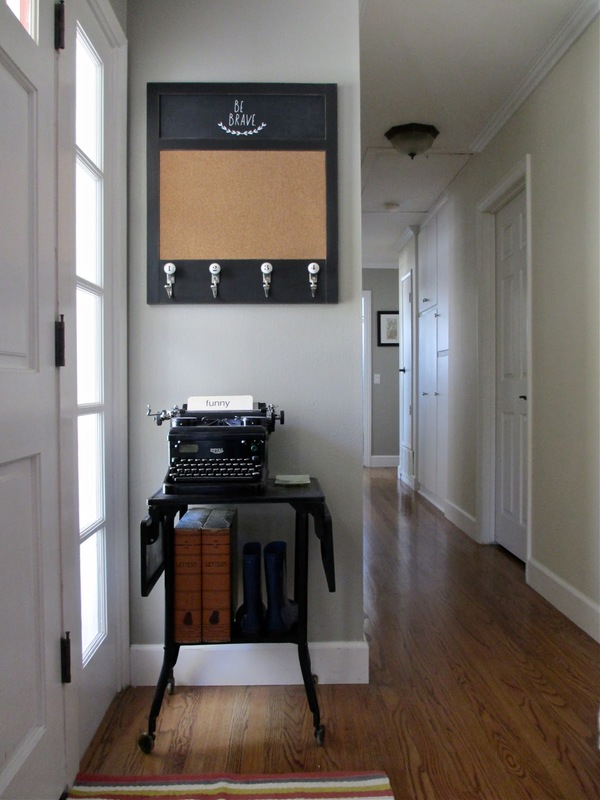 And can i borrow that adorable table and vintage typewriter for my foyer? Thanks so much for sharing. fabulous Heidi! So glad you like it...the message board and the typewriter! What a wonderful craft/woodworking project! Paula, you know I'm in awe of your mad skillz in general, but this absolutely has blown my mind. I love, love, love it!! Now, I want a full tour of your house, plus I need to hire you to come and decorate mine. You amaze and inspire me to no end! What a great solution. You certainly used some "detailed" details that make the message board look very professional. If you ever need extra $$ you and your DH could sell these in a heartbeat. I love your "creating a need" explanation. I'm copying THAT!! Oh Paula...you and I would make the BEST shopping buddies...it would be magic! I buy the same stuff all the time! 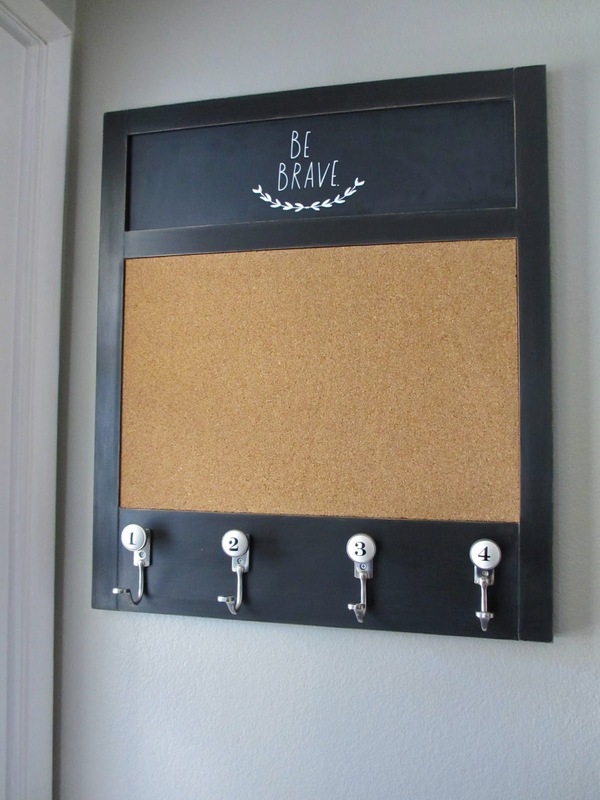 Love your cork board...so cool! The saying at the top is awesome as is the chalk board paint! What a super project - love how it all came out!! Thanks for sharing all the steps too - it is wonderful! Very, very cute! You and Jay make a great team. What paint color is that on your wall? Looking looking looking for the right paint for our living room. Sue the color is Behr from Home Depot - Graceful Gray. I know you are familiar with that store, lol. I have to confess the first time I looked at this it seemed impossible that I could do it. 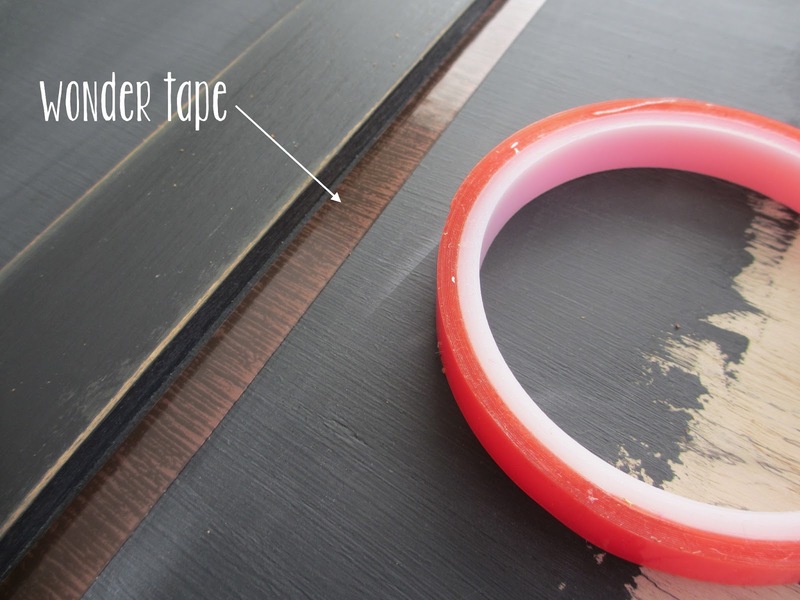 Then I read your amazing directions...and just KNOWING about Magic Tape should be enough, but no, now I WANT one. Hmmm. We don't have a nail gun. OOO. Thank you. Just thought of someone who did! Thansk a BUNCH!! Great project. Very professional and very handsome for the style of your home. I really liked the explanation of the products you used. This really sparked my imagination. And so doable! Very good job and idea. I need to do that; and have just the place.